As Paredon Blanco, the area that became Boyle Heights, passed from ownership by the Lopez and Rubio families to Irish immigrant Andrew Boyle, the change to the landscape was minimal. Boyle tended the vineyards that had been there before him and built a brick house, but little changed until Los Angeles began to experience its first growth boom in the late 1860s and early 1870s. In comparison to later booms, this was small, but it was a hint of things to come. One of those involved in developing the town in those years was Boyle's son-in-law, William Henry Workman. Workman was born in 1839 in New Franklin, Missouri to David Workman and Nancy Hook. His mother was from Virginia and his father from northern England. David Workman was a migrant to America in 1817 and settled in the earlier town of Franklin (washed out by floods later, which is why there is a "New Franklin") two years later. At this time, Missouri was the end of the United States and was a year away from statehood. David Workman was a saddler by trade and had a partnership and then went solo, finding plenty of work when Franklin became the original trailhead for the famous Santa Fe Trail, which opened in 1821 and led into New Mexico. David married Mary Hook in 1825, but upon her death in childbirth, he married his widow's sister, Nancy. The two had three sons: Thomas (1832-1863), Elijah (1835-1906), and William Henry. The family remained in Missouri for over thirty years, but David's travels on trading expeditions took him to Mexico and Gold Rush California. He opened a store in Sacramento in 1852, but a fire destroyed 7/8ths of the town, including his new business. Dejected, David ventured south to visit his brother, William Workman, owner of Rancho La Puente in the eastern San Gabriel Valley. William convinced David to pull up stakes and bring his family to live with him at La Puente. Returning home, David gathered his family and they joined a wagon train to California, leaving in April 1854. 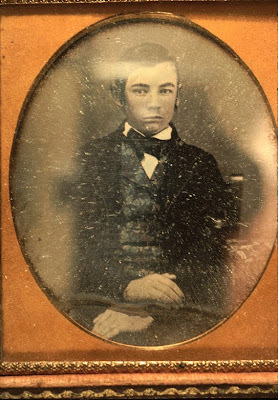 The photo shown here is of William Henry just before they left Missouri. For a little over a year, the Workman brothers were reunited, but, in late June 1855, David was killed in an accident while taking a herd of cattle north to the gold fields. His widow and three sons moved into Los Angeles and young William Henry worked with local newspapers and hauled freight by wagon until he joined his brother, Elijah, in a saddlery they ran together, off and on, for about twenty years. Elijah also was a long-time resident of Boyle Heights, living there from the 1880s until his death. In 1867, William Henry married Maria Boyle and they lived on Andrew Boyle's ranch and raised six children. William Henry also became involved in local politics, serving on the Los Angeles School Board and City Council throughout the 1860s and 1870s. In 1872, he went to Baltimore as an alternate delegate to the Democratic Party national convention. Three years later, he made his only attempt at statewide office, losing in a bid for a seat in the California Assembly. Later, William Henry won election as the mayor of Los Angeles, serving one two-year term in 1887 and 1888, which happened to be the peak of the well-known "Boom of the Eighties." Among the major projects carried out during his administration was the completion of a new city hall, the creation of a new city charter, and reform of the health department. He also served three terms as Los Angeles City Treasurer from 1901-1907, during which he was involved in the financing of bonds for the Los Angeles Aqueduct, the project that allowed the city to grow far beyond the limits imposed by the local water supply. In the 1890s, Workman also served on the Parks Commission and was involved in developing Lafayette (Westlake) Park, Eastlake (Lincoln) Park, and others in the city. His development of Boyle Heights in 1875 occurred at the peak of Los Angeles' frenzied first boom, which went bust when the bank co-owned by his uncle, William, collapsed in 1876 after the state's economy went sour amidst a national depression. For several years, the community languished along with the economy, but, in the 1880s, and especially during his mayoral stint, new life was breathed into Boyle Heights. Over the years, William Henry continued to run his real estate business, largely centered around Boyle Heights and was active until his death in 1918 at the age of 79. By then, the community was changing. Newer communities and subdivisions on the Westside and in the San Fernando Valley were drawing people away from Boyle Heights, including William Henry's widow and children, and immigrants and working-class families found the neighborhood to be affordable, close to jobs and, in the case of blacks and Latinos, one of only a few places they were allowed to live because of residential segregation. There is actually one place where Workman family members "reside" today in Boyle Heights and that is Evergreen Cemetery, where William Henry and many of his family members are interred in a family plot marked by a large headstone.